You can have your cake and eat it too! 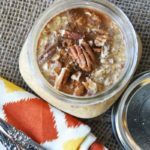 These healthy, creamy, delicious overnight oats taste like carrot cake, but they’re so much better for you. 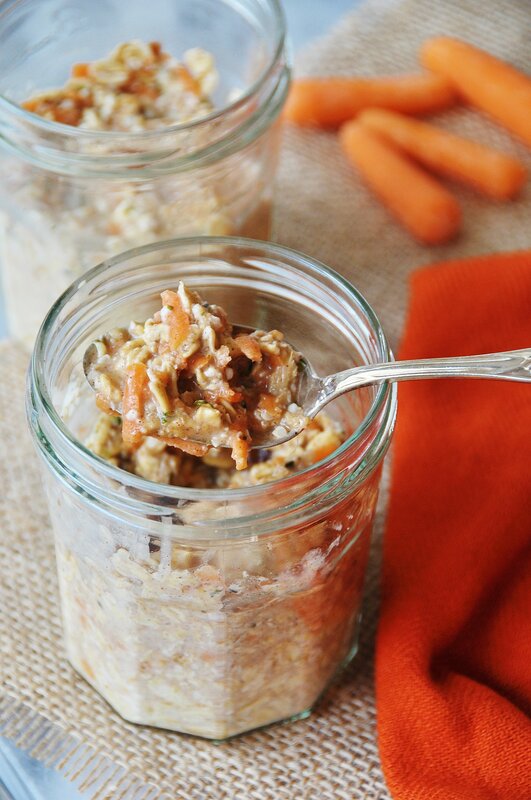 Okay, these vegan carrot cake overnight oats don’t have flour, baking powder, or oil in them, and they’re not baked, so technically you aren’t really eating cake. 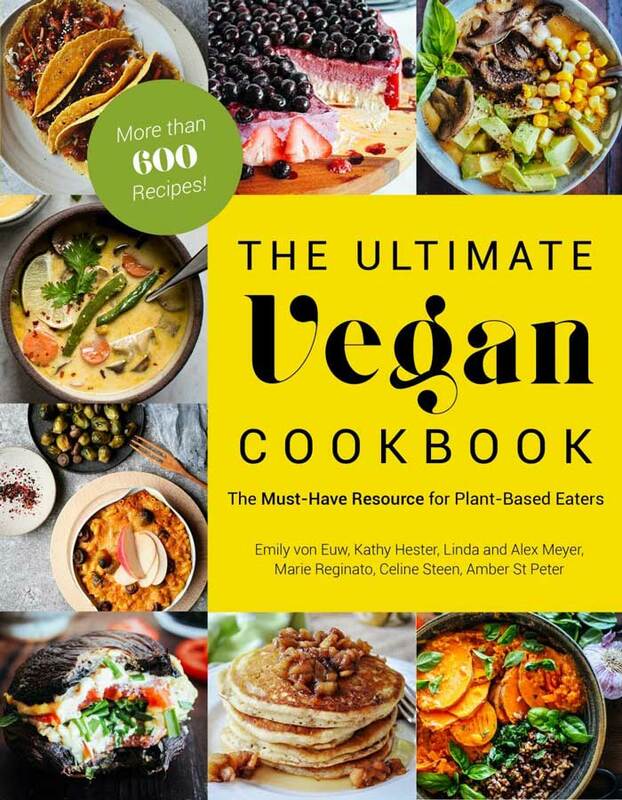 But that’s the beauty of this recipe; you’re eating healthy rolled oats, carrots, almond milk, a date, and other awesome ingredients that mingle together overnight and end up tasting like carrot cake. You can thank Alex for this genius idea. 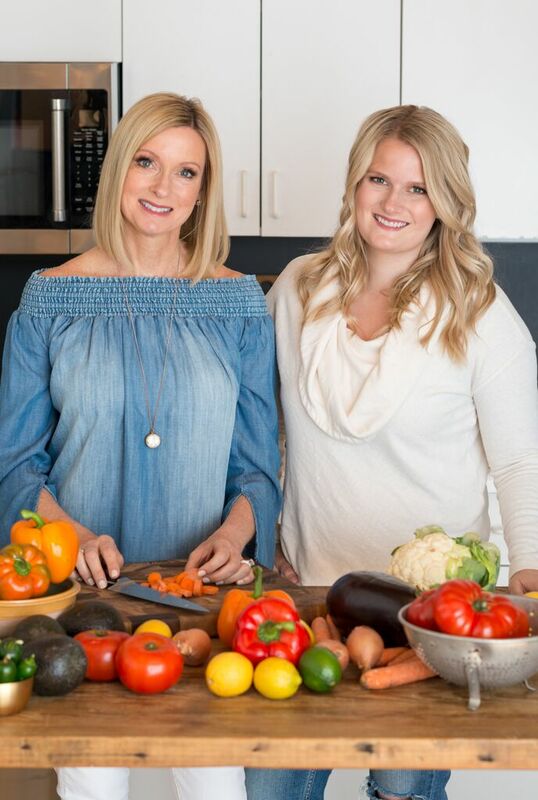 She stayed overnight last weekend and we were brainstorming about food – overnight oats to be exact – and she suggested that we make carrot cake overnight oats. My eyes lit up! Oh how I love carrot cake. The weekend slipped away and we never had the chance to make them together so I made them by myself yesterday. Waiting for the oats to soak up the almond milk was like waiting for water to boil, it just couldn’t happen fast enough. I wanted to eat them, and it was taking sooo long. 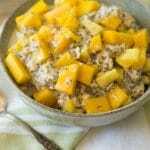 You really need to let the mixture be for at least four hours so the oats become soft and creamy. Trust me, it’s well worth the wait. 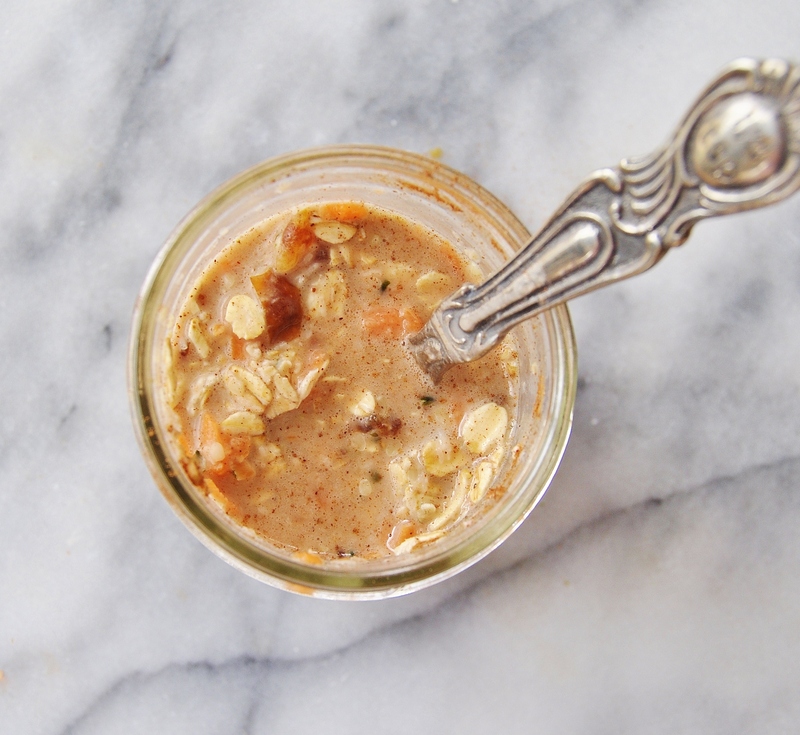 This little jar of vegan carrot cake overnight oats tastes like carrot cake, without the calories, the sugar, or the flour. 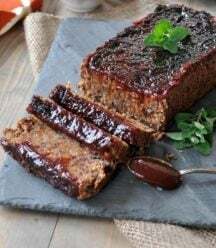 It’s sweet, but not too sweet, it’s savory (thanks to the cinnamon and nutmeg), and it has a nice chewy bite from the carrots and oats. 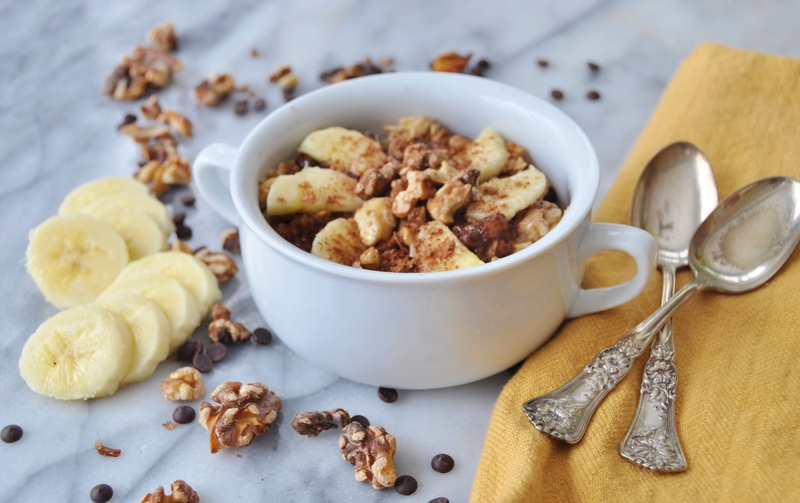 It’s so good that you might feel a little guilty eating it for breakfast, but don’t, because it’s good for you! 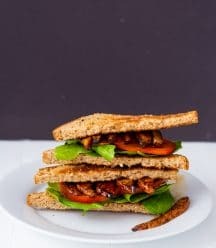 Let’s break this recipe down so you can see just how healthy it is. First you start with a half of a cup of rolled oats. 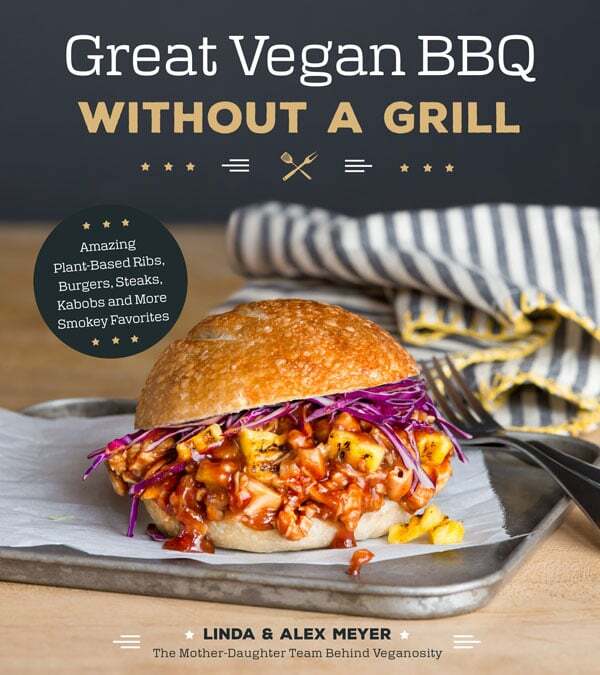 You can use steel cut but it will be really chewy. 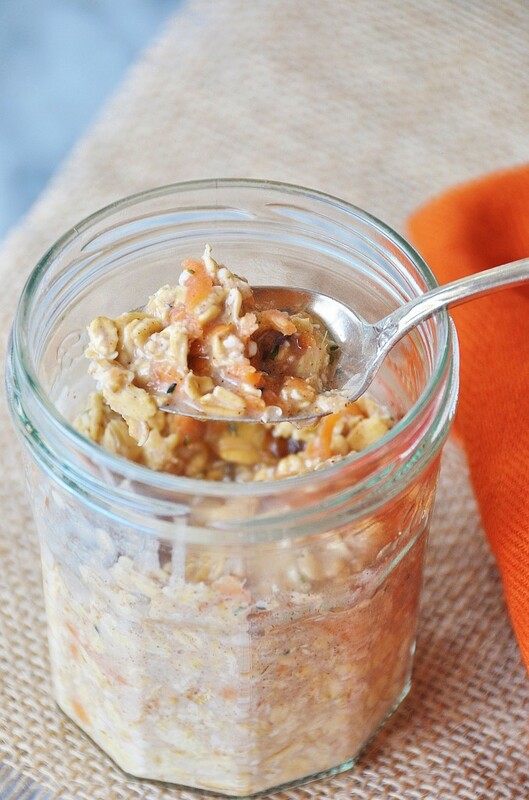 Put the oats in a jar with a lid and you can just grab it and go in the morning. 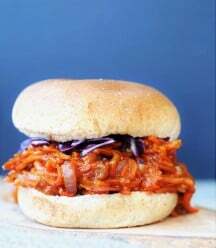 Next, add shredded carrot. 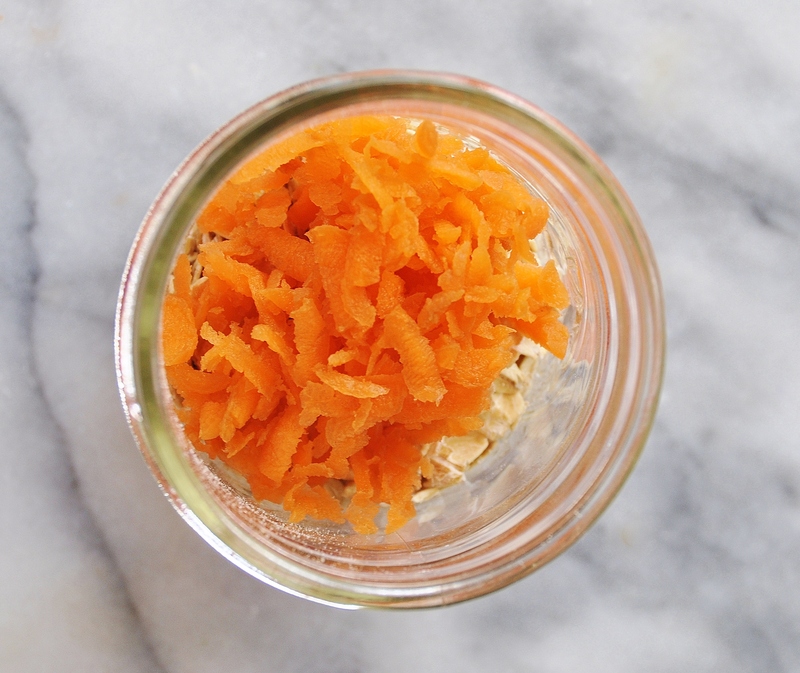 I always have a large bag of organic baby carrots in the fridge so I used a box grater and shredded three. 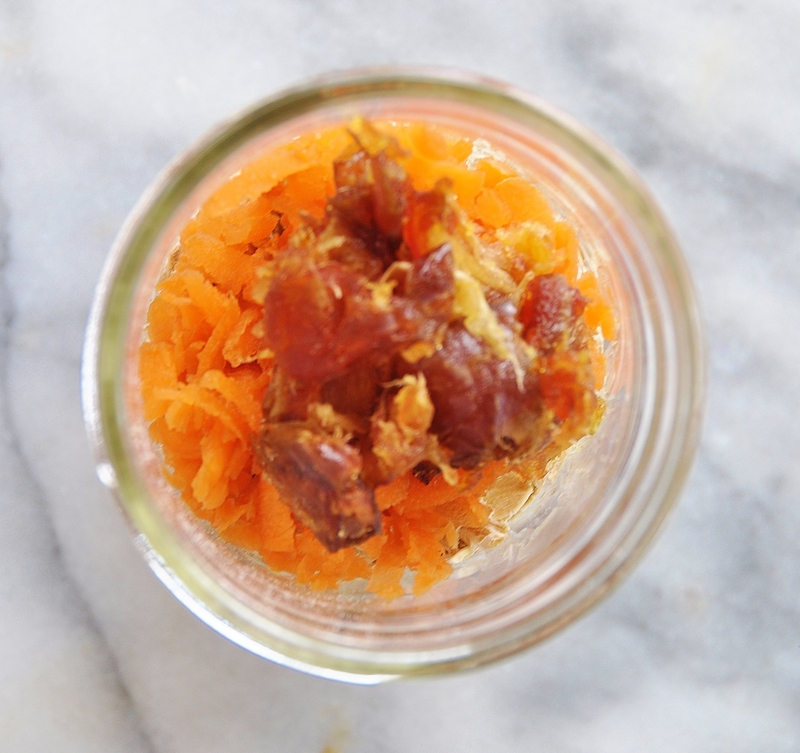 Be careful not to grate your fingers when you get to the end of the carrot. I just eat the last little stump because I’m not willing to grate the carrot to the very end. 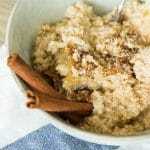 Pit a date – just one – and shred it into small pieces and then put it on top of the oats. As you know, dates are sticky, so you can use a knife to chop it up if you want, but I just tore it apart with my fingers. 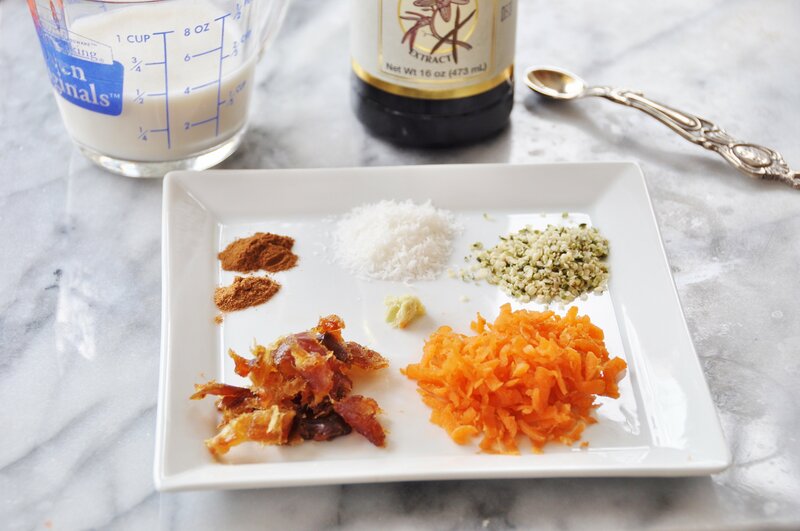 Once you’ve layered the oats, date, and carrot you can add the cinnamon, nutmeg, fresh (or dried) grated ginger, desiccated coconut, hemp seeds, and pure vanilla extract. Finally, you can pour the almond milk over the top and stir it all up until it’s combined well. I like to use a 1 to 1 ratio of oats and milk, but you can add a little extra milk if you like your oats to be wetter. Now put the lid on the jar, or cover a bowl if that’s what you’re using, and refrigerate overnight or for four or more hours. 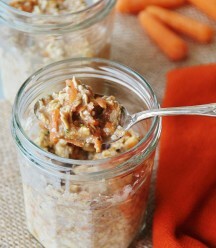 The end result is a serving of delicious, healthy, vegan carrot cake overnight oats. 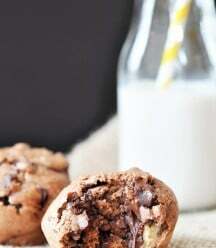 This is such a convenient way to have breakfast or a snack that’s ready to go whenever you want. Grab a jar on your way out of the house in the morning and you can say no to the doughnuts in the break room, because you’ll have a low calorie, high fiber, nutritious jar of “carrot cake.” Gosh you’re a smart one. 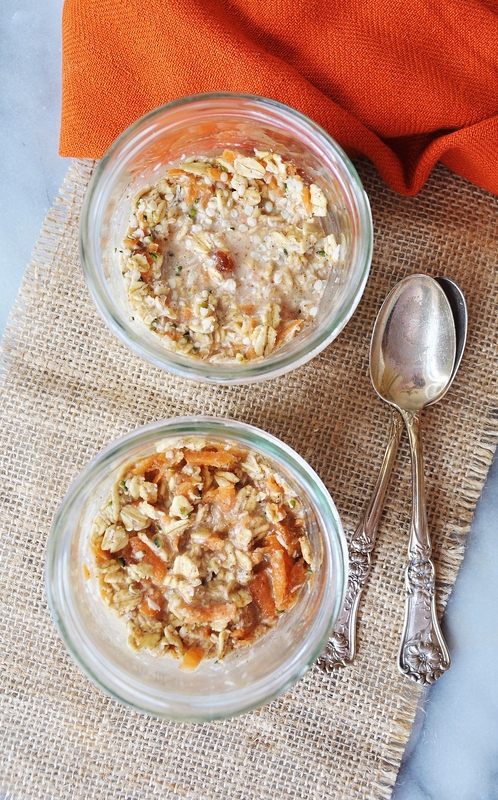 Try some of our hot oatmeal recipes if you have a little extra time in the morning. 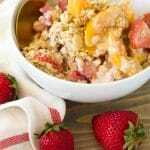 Rolled oats, carrots, a date to sweeten, cinnamon, nutmeg, and more make this healthy breakfast recipe taste like carrot cake. 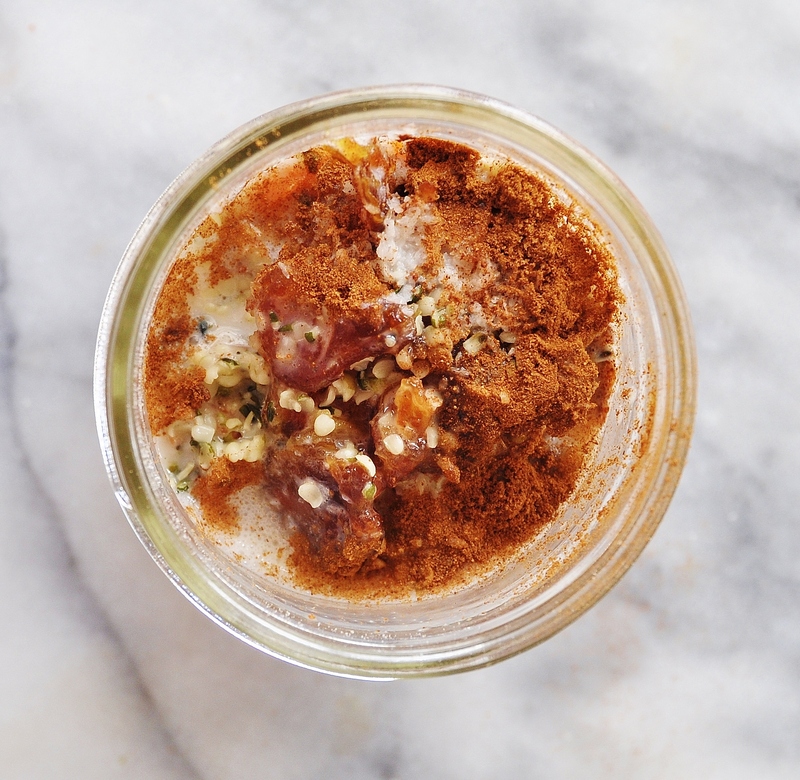 Put the oats in a jar or a bowl and then layer with the date, carrot, ginger, cinnamon, nutmeg, vanilla, coconut, hemp seeds, and almond milk. Stir well and cover. Refrigerate overnight or for at least four hours. Sorry but the nutrition information is kind of off. The oats alone are 140 or 150 calories. 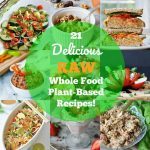 Delicious recipe though!